Since our launch in 2012, Xplenty has worked hard to achieve this kind of continuous growth and progress, and we’ve made great strides. We have helped thousands of users - including Fortune 500 companies and small-to-medium-sized businesses in a variety of industries - organize their data and prepare it for insights. Our users have run countless jobs on Xplenty, and our platform has helped them streamline their data and ultimately improve their long-term strategies. Now, Xplenty is getting even better with a brand new platform. We have been working on creating a new, improved platform for the past 12 months, and we are excited to announce that it is finally ready to launch. The new platform looks better and works faster, giving you a more positive user experience and allowing you to create, edit, monitor and control your data pipelines more intuitively and effectively. Use the new free text search bar to search for Jobs and Packages by status, duration, start or end date, completed or failed status and much more. 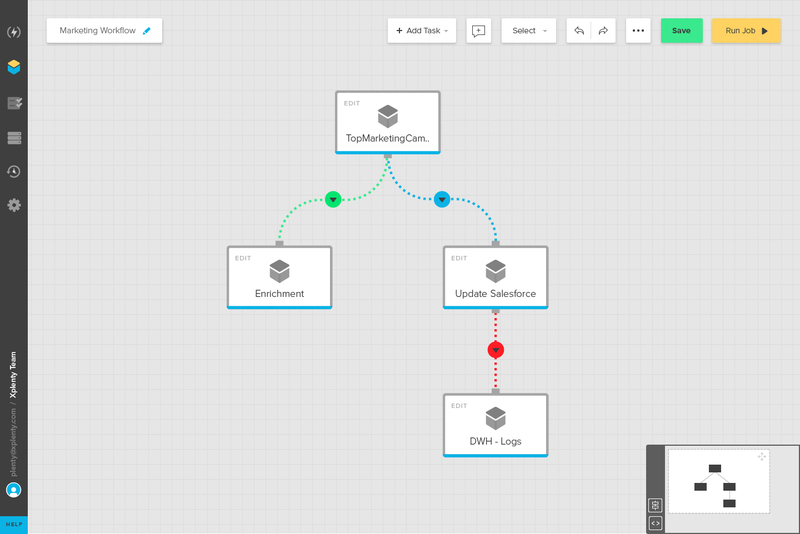 Quickly and easily create dependencies between data flows. By defining the relationships between your packages, you can trigger automatic actions (e.g. execute “Impressions load” and after you successfully execute “Daily aggregates”). This can help automate your pipelines, allowing you to run different types of packages with minimal manual effort. The new Data Flow is faster, modern and slicker-looking than its predecessor. We improved the user experience, simplified the entire data pipeline process and allowed for more advanced, streamlined capabilities. 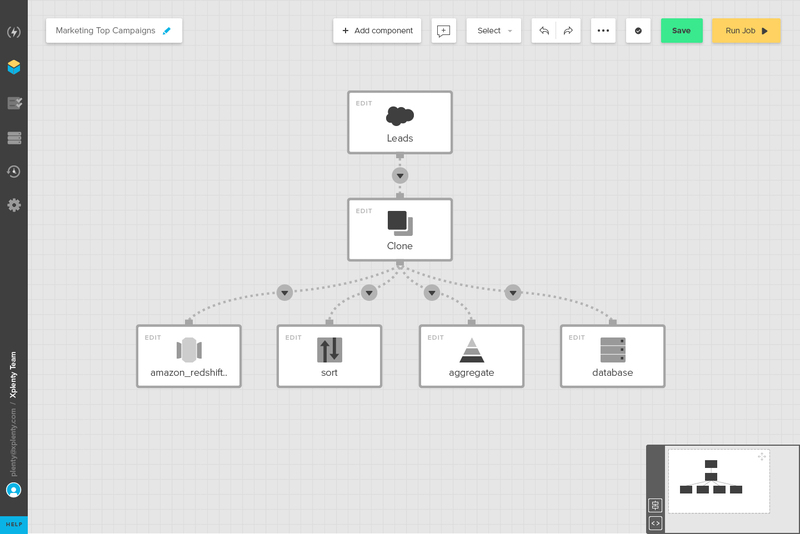 The new data flow designer can handle many more fields and components throughout the pipeline. The Inline X-Console is now available directly in the new package designer, rather than appearing in another tab. It lets you test Xplenty functions right in your pipeline to see exactly what will happen and how they’ll work. This can help avoid mistakes or confusion when creating new packages. The improved Expression Editor is better and more streamlined than its predecessor. Now, you can add more functions, use code, and connect multiple sources at once during the transformation phase. This allows you to quickly and efficiently create more complex and useful pipelines. When you’re working on a pipeline and using many components, it’s easy for the screen to become messy and unorganized. Auto-layout prevents this from happening - with one click, the tool organizes your components and cleans up your screen, allowing for faster, more efficient work. New keyboard shortcuts will help you save time and increase your overall efficiency. Xplenty’s new platform is built completely on top of the v2 API, which allows you to fully control your process and use it from your own services. Read more through our documentation. Our product and R&D teams listened carefully to all of your feedback and worked hard to deliver the features that you need most in an all-new, robust, user-friendly platform. With this new release, we’ve completed the transition to the new Xplenty platform, all with the aim of creating the most intuitive and effective ETL platform available. Want to give the new Xplenty a try? Signup now. Or, if you want to learn more about Xplenty in general, check out our webinars. Xplenty’s Salesforce integration helps you get all of your important data both to and from the Salesforce CRM easily and efficiently. How will Xplenty empower me to maintain compliance and to honor my user’s requests about their own personal data?